JohnnieFromTheBlog – Marshall Major Headphones, what is major about them? Marshall, known since the 5o’s for their massive and effective guitar amplifiers and speakers used by rock n’ roll bands all over the world. I am very much into rock n’ roll and heavy metal myself, so when Marshall released these headphones it caught my interest right away. Marshall Major, just the name itself made me excited to listen to them! 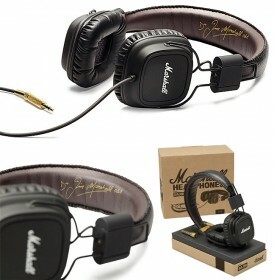 Marshall Major Headphones are manufactured by the Swedish company Zound Industries. They are currently retailing for around €95 in stores and about €80 plus shipping online. I went to my local hi-fi dealer to check them out and to give them a listening session. The first visual impression is very pleasing with its matt black finish, soft vinyl cushions, the white Marshall logo and the very handy spiral cable. Very cool looking actually! The build quality is nice, they are somewhat foldable for easy transport and they feel durable. The Marshall Major is a closed on-ear construction and they sit fairly comfortable onto your head and ears. If Marshall Major Headphones retailed for €12 I might have bought a pair just for their awesome looks as street wear headphones, but at €95 I would really not recommend them! Sure, go and have a listen at them, but if you are willing to spend €80-100 on headphones in the street wear category I strongly recommend you to go look for something else. Even at modestly €45 the AKG-518 DJ headphones outperform the Marshall Major easily. Too bad Marshall, I was expecting much more.